The laughing kookaburra watched the ground intentently for possible prey. (G. Thomas Bancroft) click on picture to see bigger version. When I was young, I loved going downstairs on Saturday mornings in mid-winter to watch Tarzan movies. Johnny Weissmuller’s call would reverberate through the house to my mother’s vexation. In my pajamas, I would curl up in a blanket on the floor in front of our black and white TV and become engrossed in the show. The exotic animals and the jungle sounds spell bounded me. Later as I became fascinated with birds, I heard that one of the background jungle sounds in Tarzan movies was the call of the laughing kookaburra. Their call is loud and often many birds in a family group cackle together to defend their communal territory. The call resonates through the landscape, and this may be why movie producers use it. They think that a sound like the kookaburra’s call must be from the jungles of Africa or South America. Kookaburra calls appear in a number of other films including “Count Dracula,” “Raiders of the Lost Arc,” “Cape Fear,” and “Objective Burma.” Kookaburras live wild in Australia and not in the places these films depict. A kookaburra also calls in the forests of the “Wizard of Oz.” Maybe they do live in Oz? 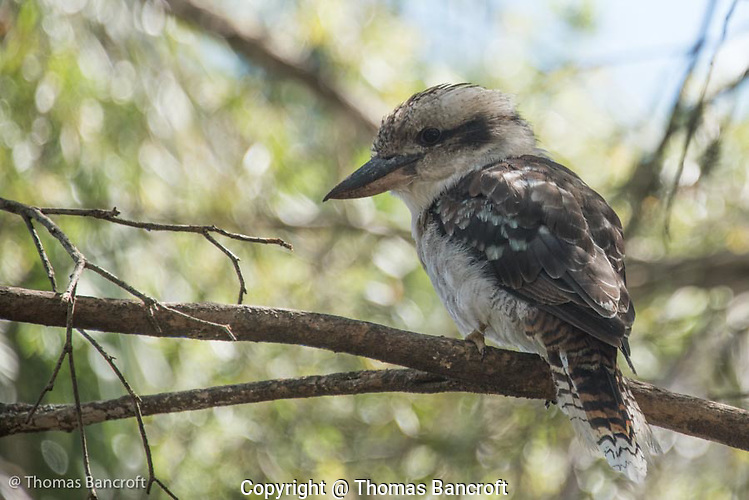 Listen to a Kookaburra call recorded by Christopher. Thanks to him and soundbible.com for making it available. Before my trip to Australia, I saw a live laughing kookaburra only once in a zoo in Florida. It sat majestically on a branch about 10 feet above the ground as I walked through its aviary. I stood and watched it for half an hour until my 5-year old daughter insisted we continue. The bird never called or even moved. As I planned my trip to Australia, one of my quests would be to see and hear laughing kookaburras in the wild. They are native to eastern Australia, and people have introduced them to Tasmania. Kookaburras are the largest member of the kingfisher family, weighing about a pound, 18 inches in length, and they possess a large 4-inch bill. They live in eucalypt forests, open woodlands, parks and suburban neighborhoods. They rarely eat fish but rather feed on snakes, small mammals, birds, lizards, and insects. They sit motionless on a perch watching the ground and surrounding area for prey. When they spot something, they fly down to grab it, returning to their perch where they may whack it repeatedly on a branch to kill it and tenderize it before eating it head first. To start my Australian odyssey, I flew to Hobart in Tasmania to meet up with my daughter, her husband, and his family. We planned to tour Tasmania for a week. I had the first morning free to explore on my own, so I hopped the first city bus in the morning that went southwest of Hobart, and I was the only person on the bus. I was surprised to discover that the driver could give me change for my ticket. No buses in the places I have lived in the United States give change for fear that someone will rob the driver. The money sat in a tray between the driver and me. The driver kindly looked at my map and helped me determine where to exit his bus so I could walk into the Peter Murrell Reserve. He worried that I would have too long a walk to come back to find the return bus, but I shrugged and jumped off the bus. Black peppermint trees dominate this dry sclerophyll forest. The forest contained a thick understory of shrubs and grasses. A few grassy meadows broke up the contiguous forest. Birders regularly find laughing kookaburras in this reserve, and I was out to find one. Kookaburras occur in family groups with young staying for several years to help their parents raise subsequent broods. As I walked through the eucalypts along Coffee Creek Trail, I heard my first kookaburra. The call started as a low chuckle, growing through a series of trills, chortles, and into a full belly laugh. I stopped dead in my tracks to take it all in. Over the next 20 minutes one or more birds called. I tried to creep over to see them but never did find them. 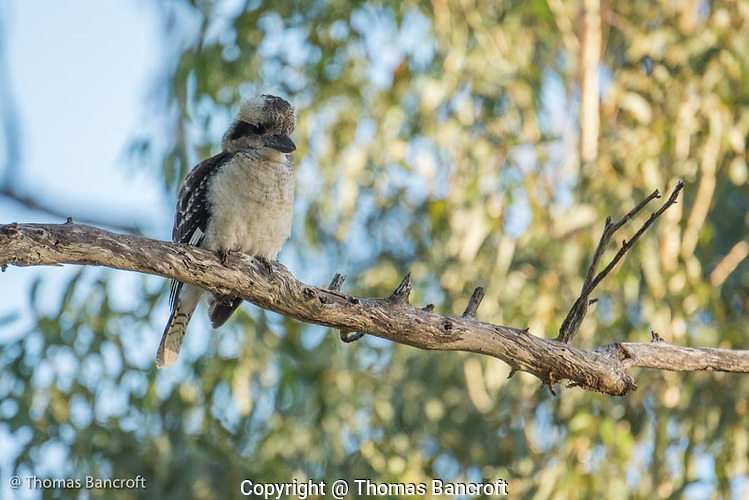 With this call, kookaburras defend their territories, which they keep throughout the year. If a kookaburra from a nearby family responds, all the members of the original group may join in a loud and rambunctious series of laughs that can last several minutes. The next day we drove into the western wet part of Tasmania, and I did not hear or see another kookaburra for almost a week. I spent two days birding at Dandenong Ranges National Park and You Yangs Regional Park near Melbourne on the southern mainland of Australia. I had good looks at laughing kookaburras in both places but in neither case would the birds allow me to move in close. I wanted to see the details of their plumage and admire their massive bill. My chance to observe them up close came when I visited friends near Warwick in southeast Queensland. Penny had told me that kookaburras would serenade me at dawn from outside the bedroom window where I would stay. Penny’s bed and breakfast is spectacularly situated in a rural landscape that is perfect for birds. The first morning I walked along their driveway where I could look through the eucalyptus trees toward the river below. I spotted one sitting on a branch with its head cocked slightly to one side. I crept slowly along the driveway until I could watch it carefully. A dark brown line extended from his eye to the back of his head, and he had a dark spot on the back of its head. A light creamy stripe of feathers ran above the eye, and the bottom of his head and collar were light gray. I couldn’t believe how massive his bill was. It reminded me of a large pair of needle-nose pliers. The dark brown feathers on his back and wings had white-tips, and I could see the textures of the individual feathers. After a few minutes, he turned around so I could see his creamy white underside and even see the nails on each toe gripping the branch. I don’t know if it was a male or female for they look very similar. Females are often slightly bigger. His gaze at the ground became riveted, and then he flew down to the ground to probe among the grass stems. I could not tell if he caught anything before he flew farther down the hill. I stood for a few minutes taking in this splendid bird before I headed back toward the house for breakfast with my friends so excited to tell them of my find. On my last day at Penny’s place, I woke well before dawn, and as I lay in bed, I heard a loud chorus of laughing kookaburras tune up in her yard. They called back and forth amongst themselves for several minutes, and I drifted back to my childhood and those Tarzan movies. For a few minutes, I thought maybe I was again 9-years old. But no and I quickly rolled out of bed to go out to see these magnificent birds. Several birds hung out in the scattered eucalypts in their yard. Here is a recording of the morning chorus that I made a few days later in the Atherton Tablelands of northern Queensland. The morning was just waking up and several species called in the first light of the day. Seeing this unique bird and especially hearing their raucous calls will remain a cherished memory of my Australian adventure. Do you have a birdcall that you just love to hear and that brings back fond memories? The laughing kookaburra turned around to show its creamy white chest and belly. (G. Thomas Bancroft) click on picture to see bigger version.